'Lavender has been a favourite fragrance for centuries and is said a relieve stress and create a peaceful atmosphere at home. 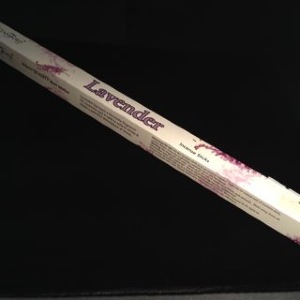 Incense is a composed of aromatic plant materials, often combined with essential oils. These sticks need to be lit directly with a flame and then fanned or blown out, leaving a glowing ember that smoulders and releases fragrance, place the stick into a suitable holder clear of any flammable materials also taking care where the ash ill fall and never leave any burning or smouldering products unattended.